When I think of Little Mix, I think feisty, embowered, sassiness and black, lots of black. One of my favourite colors. So when I heard that Little Mix were collaborating with Elegant Touch to bring out their own line of press on nails, naturally I got a little excited. I'm not a massive Little Mix fan, but the second I saw the design on these nails I knew I had to have them. Each of the girls has their own box of nails which stays true to their own personal style and clearly if you have a favourite member of Little Mix, you can just buy their nails. 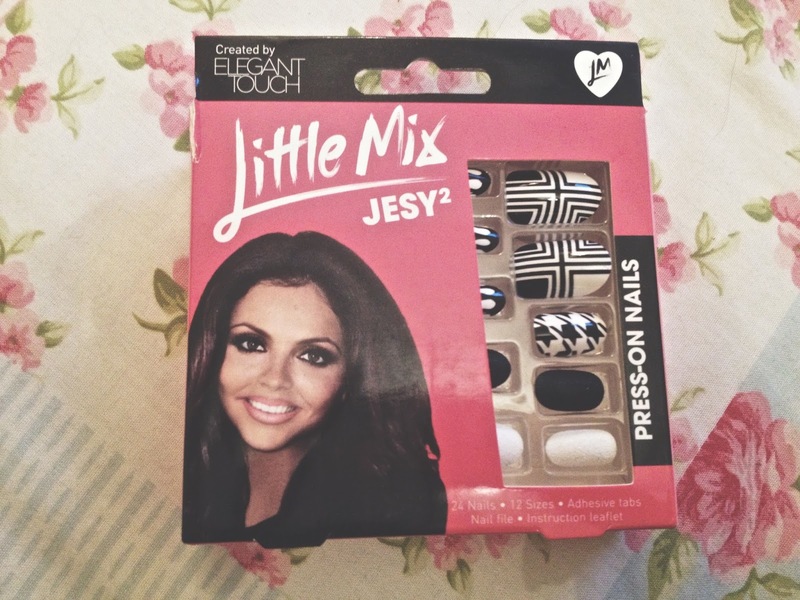 Jesys nails grabbed my attention the most and too me FOREVER to find. 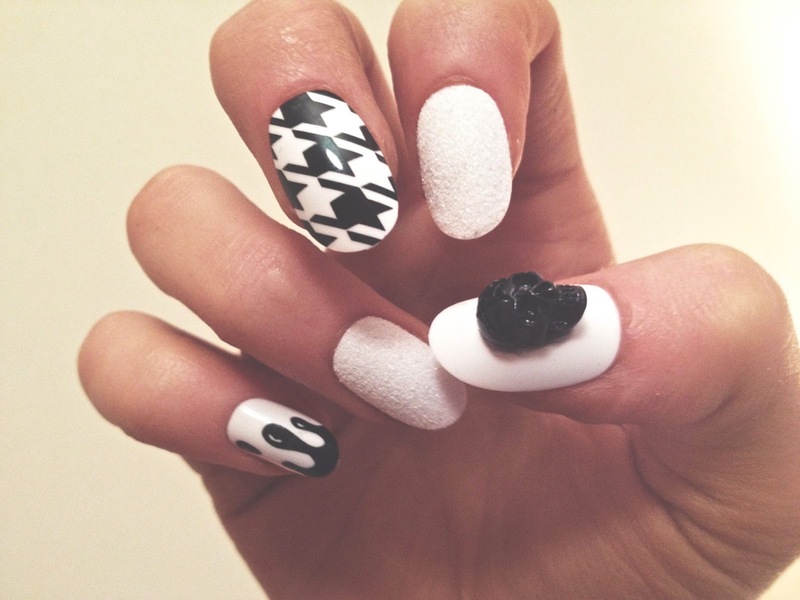 They're monochrome, on trend with bulging skulls and houndstooth prints. Key for aw14. 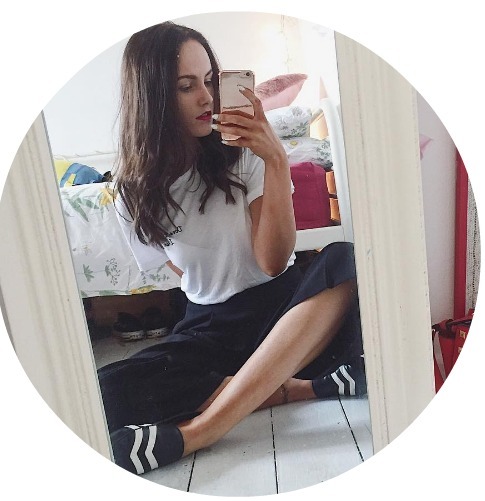 I'm a sucker for black and white and with hounds-tooth print and just monochrome in general being incredibly on trend right now these look great. I've recently struck up a fondness for false nails and upon purchasing these nails, I didn't realise theywere in fact press on nails and didn't come with any glue. Considering their tween fan base this was a clever move on Elegant Touches behalf, parents don't want their young tweens messing around with nail glue and press on's are an easy way to boost up sales. There's a number of different sized nails within the box which caters for all nail sizes. I found some of the nails were actually ridiculously big in comparison to other false nails I had used and I had to spend a lot of time filing them down. I don't know what Elegant Touch were thinking with this considering the Little Mix fanbase are quite young and as a result would have tiny little hands? Maybe they weren't targeting the Little Mix fan base at all, who knows but definitely something to remember if you buy these nails, set some time aside. I found the press ons to be quite awkward and not durable in the slightest. The stickers were awkwardly shaped and difficult to size. I tried cutting them in half with a scissors but that didn't work either. Once i got the nails onto the sticker they barely lasted 6hrs before one fell off and I grew fed up and pulled the rest off as i was afraid i would lose one of the nails. I grew fed up and opted for applying them with some nail glue i pulled from a primark false nail pack which did the job nicely. After some filing the false nail fit my nails perfectly and lasted as well as expected before i had to remove them before work. The white nails were a little awkard, and discoloured quite quickly but the others lasted very well and i was surprised at the sturdiness of the skull on the thumb finger which I was sure would become loose after a couple hours. 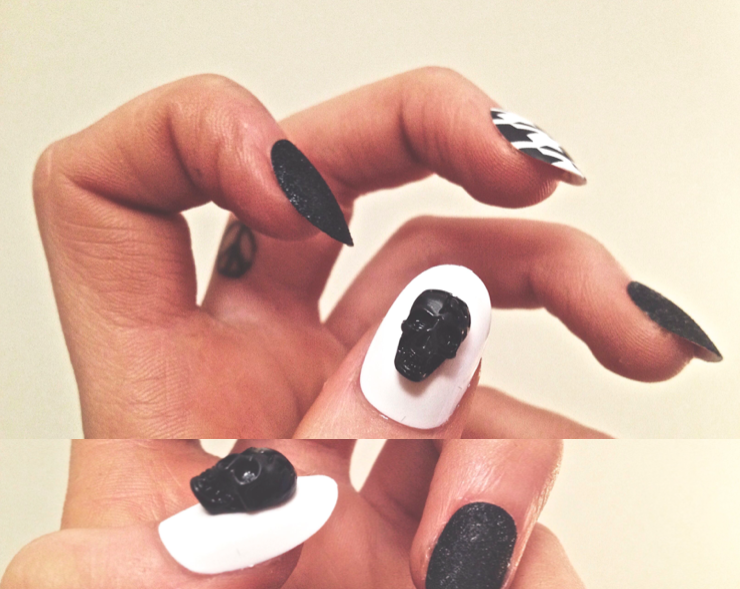 The Jesy nails are incredibly stylish and by far my favourite design from the Little Mix edition. I've had lots of compliments on them. I've picked up the other packs and i'm excited to give them a go, they're so quirky and stylish. I won't be using the press on stickers though, thats for sure. I hate when false nails have loads of massive ones in the packet!! They are gorgeous though, so eye catching. That photo of Jesy on the box is awful, so much editing! Love the houndstooth ones.